SMOK drops the mic with the delivery of the SMOK Veneno 225W TC Starter Kit. Light up the world in possibly the most beautifully designed light em up kit yet. Paired up with the TFV8 Big Baby Light Edition Tank this mod is for the heavy hitters in vaping who love something attractive in their grips that also produces spectacular vapor and flavor. 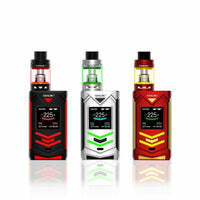 SMOK Veneno 225W TC Starter Kit - SMOK has a rating of 4.8 stars based on 74 reviews.